We have received notice that the cost-shared programs under the Canadian Agricultural Partnership will be suspended for 30 days. NSFA appreciates the invitation from Minister Colwell to share our concerns with the recently announced programs. We will provide details about these concerns in writing to Minister Colwell ahead of a face to face meeting on May 1st. Truro, NS – Programs recently released under the Canadian Agricultural Partnership agreement for Nova Scotia Farmers are limiting, at best. On April 16, Nova Scotia Department of Agriculture announced five programs to “support sustainable growth of Nova Scotia’s agriculture and agri-food sectors”. There are major flaws in the eligibility for these programs. The most obvious change from past programs is the increase of farm revenue minimum to $30,000 from $10,000. Leaders in the Agriculture Industry were assured by a representative from the Department of Agriculture at meeting in February that a program to support the growth of farms with gross revenue under $30,000 was in the works to be released. NSFA is disappointed to see that the program isn’t yet available. In addition to the increase in minimum gross farm revenue, specific program details are alarming. Based on the financial assistance available under the Soil & Water Sustainability program, it is evident that protecting the environment is not a priority of the government. For other programs, eligible items and activity indirectly hamper any growth in many sectors. For example, the Missions and Investigative Travel program applies to farms that are export ready, which precludes all meat processed in Nova Scotia abattoirs. “A healthy environment is a public good. All farms should have equal access to funding for qualified projects that support efforts in protecting the environment,” expressed Oulton. 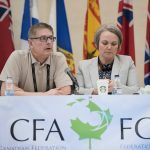 Nova Scotia Federation of Agriculture hopes to see appropriate changes to the programs under the Canadian Agricultural Partnership in the very near future. Bible Hill, NS – Nova Scotia farmers will have representation at the Canadian Federation of Agriculture AGM taking place this week in Ottawa. Under the theme “Partnering for Success” the meeting agenda features topics such as international trade negotiations, economic growth strategies, and newly announced government programs. CFA is also hosting a symposium on research and best practices in mental health in agricultural communities. An announcement will also be made on a new partnership and an awards initiative for farmers who show leadership in the area of mental health. “Working with farmers throughout Canada to identify, prioritize and address issues at a national level demonstrates solidarity across the industry,” said NSFA President, Victor Oulton. While in Ottawa, NSFA representatives Victor Oulton, Tim Marsh, Chris van den Heuvel and Henry Vissers will partner with representatives from the additional three Atlantic Federations of Agriculture to meet with Federal Minister of Agriculture, Honourable Lawrence MacAulay, to discuss topics with a national scope relevant to Atlantic Canada. “Many changes are happening at the national level which will have an impact on farms. Carbon pricing and taxation of private corporations are just a couple of topics we look forward to discussing with Minister MacAulay this week,” elaborated Oulton. More information on meeting details can be found on the CFA website. The Nova Scotia Federation of Agriculture with the funding support of NSDA ThinkFARM is working with Gary Morton (SKU Foods Inc) and your local Agriculture Resource Coordinators to better understand the need and commitment from farmers for a Farm Apprenticeship Technician Program in Nova Scotia. There are many reports and statistics that highlight the local labour market in Nova Scotia, the skill needs, and labour demands as agriculture moves forward into the future. There are also a variety of options to fulfill the challenges, one of them being to establish a Blue Seal Farm Technician Apprenticeship Program like the one currently in Prince Edward Island, where classroom training components are delivered by Dalhousie University. The NSFA and the Nova Scotia Apprenticeship Agency want to better understand your impression, interest and commitment to an apprenticeship program specific to general farm labour in Nova Scotia. There will be five focus group sessions across the province and if this topic is of interest, you are encouraged to either contact your local Agriculture Resource Coordinator (ARC) or contact Gary Morton at 902-670-3992 gary@skufood.com for participation details. Monday, January 29 – 1:00 – 3:00p.m. Friday, February 2 –1:00 – 3:00 p.m.
Tuesday, February 6 –1:00 – 3:00 p.m.
As Growing Forward 2 enters its last year of programming, negotiations and consultations around the Next Policy Framework are ramping up. In preparation for upcoming consultations, NSFA has developed a document to help our members with preparation for the consultations. This document can be used as guidance and recommendations for your consideration to bring forward at these consultation sessions. Next Policy Framework: A Nova Scotia Perspective can be found here. Considering the amount of snow that was dumped on Nova Scotia during Valentine’s Day week, some people may find it difficult to believe that global warming is really happening. Regardless of your position on climate change, one thing is for sure: there will be a price on carbon in the near future. Details on the Nova Scotia Cap and Trade Program are beginning to surface. On February 9th, the Colchester and Truro Chamber of Commerce and the Pictou County Chamber of Commerce partnered to deliver a panel discussion on the impacts that a price on carbon will have on industry. During this session, attendees had the opportunity to hear from Department of Environment and the plan for the Cap and Trade system that is to take effect in Nova Scotia. While the fine details of the program are being worked out, a high level concept is in place. To recap, in 2016 the Federal government announced that there will be a price on Carbon and it will be up to each of the provinces to implement either a tax on carbon or a cap and trade program. An announcement in late fall indicated that Nova Scotia will go with the Cap and Trade model for carbon pricing. The government sets annual maximum greenhouse gas emission unit caps that are progressively lowered over time. If a business produces more carbon emissions than the cap allocated, the business is required to purchase enough offset credits for each additional ton of Carbon dioxide equivalent they release into the atmosphere. If a business produces fewer carbon emissions that the cap allocated, the business may sell or trade their remaining offset credits. 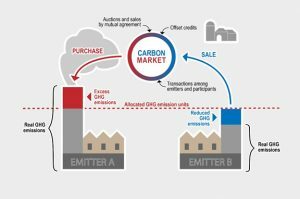 Companies, even those that are not required to report emissions, can sell into the “carbon market” by providing offset credits from approved projects. 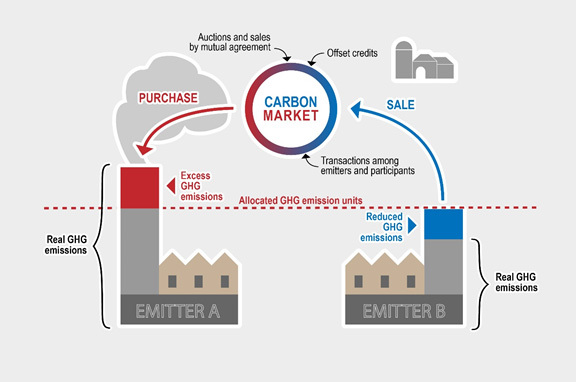 Figure 1: From the Province of Quebec’s website, a diagram loosely explains the path of trading carbon emissions and offset credits through the carbon market. From what we know so far about the Nova Scotia Cap and Trade program, agriculture and forestry are two industries that will not be required to report emissions. This is definitely a win for agriculture. Additionally, companies and organizations will be able to develop projects for which they will be able to sell offset credits into the Nova Scotia carbon market. These projects will be assessed individually by Department of Environment based on criteria that is not yet developed. An example of an agriculture project in another jurisdiction that has a cap and trade program is energy generation using methane capture. For those familiar with the Quebec Cap and Trade Program, the Nova Scotia Program is different in that it is not designed to be part of an international carbon trading market. The Nova Scotia Program will be tightly regulated – including the price on the carbon offset credit. This approach will lessen the burden to businesses of possible price influctuations for offset credits. However, it was stated at the carbon pricing session that if a business is selling offset credits and is not regulated as part of the Nova Scotia program, they are free to apply to sell their offset credits in an international carbon market. At this time, we are talking in the $15 to $20 range. For the businesses that are regulated under the program, they will be given the number of credits up to the cap. If the business exceeds their allowable emissions, they will be required to purchase offset credits. Purely speculation at this point until details are release – it is likely safe to assume that offset credits will be set at $10 per ton starting in 2018 and continue to increase incrementally until a credit is valued at $50 per ton in 2022, as per the Federal requirements. It’s impossible to talk carbon pricing without discussing where the funds will go and how they will be used. Cap and Trade makes this clear – the revenues generated will go to those who sell the offset credits. This means that the revenues generate by the sale of offset credits are considered part of the business’ earnings and not tax revenue for government to decide what to do with in the next budget. When it comes to carbon pricing and agriculture, Cap and Trade is the lesser of two evils when compared to a carbon tax. Arguments have been made that a carbon tax is easier to administer since it is simply a tax on an item; however, Cap and Trade is much more favourable to agriculture since the program allows for the Agriculture industry to be part of the solution while generating revenues. There are different ways that agriculture can be part of the solution. In 2010, a report exploring carbon offset in the Maritime livestock industries was produced. There were many case studies and examples made indicating how certain practices or projects can be implemented to reduce greenhouse gas emissions. Though the numbers may be dated, the 140+ page report does a good job at looking at case studies and providing examples of which projects can provide the most revenue for farms. Examples of these projects include adjusting feed to reduce methane emissions from livestock and energy generation. Following the panel session put on by the chambers, much interest expressed by members of the farm community in attendance for more information on managing woodlots for carbon offset projects. Woodlots and forests are natural carbon sinks. In many jurisdictions, managed forests are considered for carbon offset projects. It was argued that carbon pricing may even help the lumber industry in Nova Scotia. Presently, the size of wood harvested from Nova Scotia forests is very small. 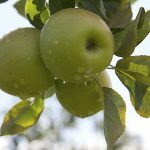 In theory, if a landowner were able to generate revenues by selling offset credits, they financially would be able to hold off harvesting their trees until they reach a larger size. In turn, the woodlot owner would make more money off their lumber. The full details of how forests and woodlots can be carbon offset projects still needs to be worked out. Though we know a lot more than we did even a month ago, what cannot yet be analyzed is the full impact that carbon policies will have on agriculture. The Agriculture Industries in each of the provinces are interdependent. Fuels, fertilizers, machinery and building supplies often come in from out of province. These goods may be subject to the carbon pricing policy that is implemented in the province in which they are produced. Without details of the policies in each of the provinces, it is difficult to make to true analysis on the overall impact to the agriculture industry. We also don’t know how we will be protected by imports that are not subject to carbon pricing. The muddy waters on carbon pricing are starting to clear. It will be some time – probably at least a year – before we have a true sense on how carbon pricing will impact agriculture. In the meantime, we all better prepare for change.